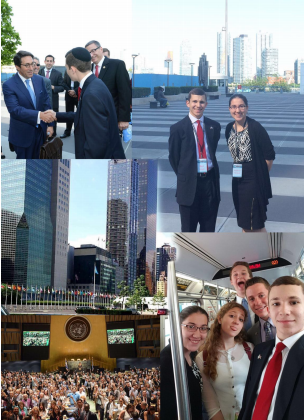 On Tuesday, May 31st, the first ever Ambassadors Against BDS conference was held at the United Nations. 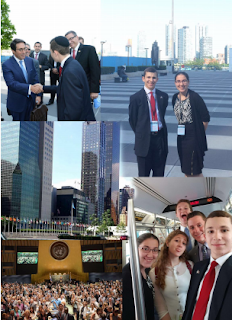 Six Yeshivah of Flatbush students from the Israel Advocacy commission attended, including new commissioners Ben Wade and Amanda Heskiel, former commissioner Morris Shalom, along with Max Shemtob, Naomi Sanders, Deborah Coopersmith, and our chaperone Mrs. Sara Idy. The purpose of the event was to gather pro Israel Zionists to condemn the international anti Zionist and anti semitic movement, Boycott Divestment and Sanction (BDS). The event consisted of three sessions with speakers, including Israeli emissary to the UN Danny Danon, President of the World Jewish Congress Ron S. Lauder, CEO of the Anti Deformation League (ADL) Jonathan Greenblatt, SodaStream CEO David Birnbaum, Vice President of the Supreme Court of Israel Justice Elyakim Rubenstein, and Chief Counsel of the American Center for Law and Justice (ACLJ) Jay Sekulow, who commissioner Ben Wade had the privilege of meeting. The event attracted 1500 people, 1200 more than was expected to attend. This was only the first of many events condemning BDS, and more are likely to follow as a result of the record turnout.